The 4x100 relay runs the 2nd fastest time in school history. In the finals, the team earns 4th place medals. Brandon Prato earns a 4th place medal in his specialty, the discus, with a toss of 138'-1". Junior Nick Velez runs a 4:28.66 FAT which was 4th best in the 1600 meters. Rob Ruspantini breaks 4:40 and Mateo Velez & Dan Rosenbauer break 5 minutes. Tom Walsh runs a solid 5:23.5 - a PR of over 1 minute! Whalen runs 23.64 FAT! 5/20 - Frosh Islands - Farrell H.S. Lucas Lafferty wins the frosh S.I. long jump title with a jump of 17'-5". 5/18 - East Coast Relays - Randolph H.S. The Varsity 4x200 relay takes down a 16 year old school record with a 1:32.74 FAT. Joe Somma (23.0), Garth Ikomi (22.9), Jordan Daniels (23.5) and James Mahoney (23.0) made history! The previous record holders were: Jimmy Salerno (23.2), Adam Ogbu 23.8, Jimmy D'Esposito 24.0, Jimmy Melvin 23.4) which was set at the Farrell Invitational on April 10, 1999. Despite a successful early part of the indoor season; the team fell flat during the later part of the championship season. The varsity team placed 8th at the indoor sectionals and 11th in the inaugural NYC Championships (The combined NY & BQ Sectionals). The goal this outdoor season was to win the outdoor island title and run well in late May/early June. 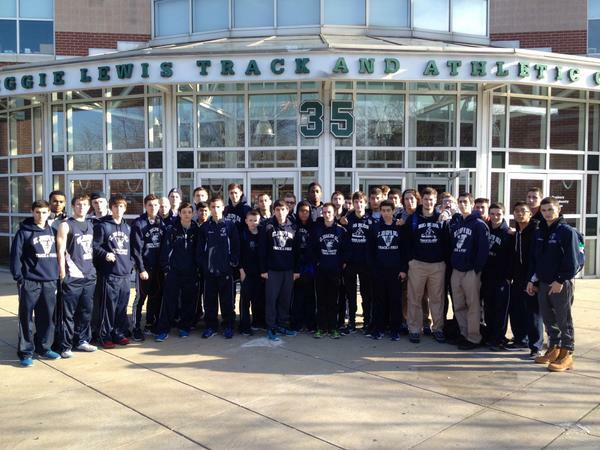 Today, the team showed they were well on their way with a 4th place finish in the NY Sectionals by scoring 43 points. In the NYC Champs, with the Brooklyn/Queens teams included, we finish in 5th place. The Varsity 4x100 of Garth Ikomi, Jordan Daniels, James Mahoney & Dom Anderson win the Sectional & NYC Championships. Their time of 44.41 FAT is the 2nd fastest in school history. Nick Velez has a solid double by finishing in 2nd in both the 800 (1:57.31) and 1600 (4:27.90). Robbie Guidicipietro (2:00.4) and Rob Ruspantini (2:01.7) set PR's on the 3rd place 4x800 relay. 5/9 - Louck's Games - White Plains H.S. On Saturday, the mid-distance runners are competitive in the fast Louck's mile runs. Nick Velez sets a 10 second PR while running 4:23.36 FAT. Rob Guidicipietro is the 2nd Viking on the day and runs the 2nd fastest mile of his career in 4:33.31 FAT. Rob Ruspantini sets a 8 second PR with a 4:43.62 FAT. On Friday, with a short warm-up due to traffic Nick Velez (1:59.21) and Rob Guidicipietro (2:02.37 FAT) run the 800. Joe Cottone wins the Soph Intersectional high jump on misses with a 5'-4" jump. He later gets a silver medal in the long jump with an 18'-3" jump. Kyle Sinclair hops, skips & jumps to a gold medal in the soph triple jump with a 37'-7". He also placed 4th in the high hurdles. Lucas Lafferty placed 3rd in the frosh long jump with a 17'-8" jump. 5/7 - Loucks Games - White Plains H.S. The Varsity DMR record goes down in the East Coast Challenge race. The record stood on the books since 1997! Nick Velez got the team out in the race with a superb 3:09.5 - 1,200 leg. Joe Somma set a PR with a 51.7 on the 400 leg. Rob Ruspantini ran 2:02.2 and Rob Guidicipietro ran the anchor leg with a 6 second PR on the 1600 while running 4:29.7. Their time of 10:33.37 FAT is currently ranked #10 in New York State. The exciting part is...all 4 runners are juniors! The former record holders were the who's who of Sea mid-distance running in the late 90's - Anthony Canova (3:11.3, Adam Risi 51.7, Keith Pearson (2:01.9) & Matt Rosselli (4:29.2). They ran 10:34.91 FAt at the Colonial Relays on April 5, 1997. A few athletes drive up to Icahn Stadium and repa the rewards for their trip. Kyle Sinclair is wins the NYC & Sectional Triple Jump title. His 39'-9" jump breaks a soph school record that he had with Joe Tufano in 2006. Joe Cottone wins the NYC & Sectional title in the long jump with a jump of 18'-9". He also added a 3rd place finish in the high jump.. Freshmen Lucas Lafferty wins the NYC & Sectional title with a 17'10". 5/3 - Staten Island Championships - Farrell H.S. For the first time in Sea history, the team wins the outdoor S.I. Championship. The team is impressive throughout the day and our balance was the key to victory with a 66 point cushion over defending champion Msgr. Farrell. The team got the lead in the first event and withstood the big point waves from Farrell (Javelin & PV) and McKee/S.I. Tech in the hurdles and HJ. Island Champions include: Brandon Prato (Discus), Nick Velez (1600 & 800), Garth Ikomi (100), Robert Guidicipietro (3000 Steeple) & the 4x800 Relay. Prato wins the discus for the 3rd consecutive year in a row and Ikomi defends his 100 meter title. 2015 Staten Island Outdoor Champions! After a disappointing race in the 4x100; the Vikings win their heat of the 4x400. This is the second time in school history that the team has won a prestigious plaque for being a heat winner at Penn. 4/10 - Friday Night Lights - Farrell H.S. A quick short Friday night meet yields lots of medals and more PR's. The team is starting to round into shape. We win all of the running relays and establish a new school record in the short sprint medley. 4/6 - Iona Prep Invitational- Iona Prep H.S. The Vikings work off their Easter meals by collecting a bunch of medals and setting many PR's. 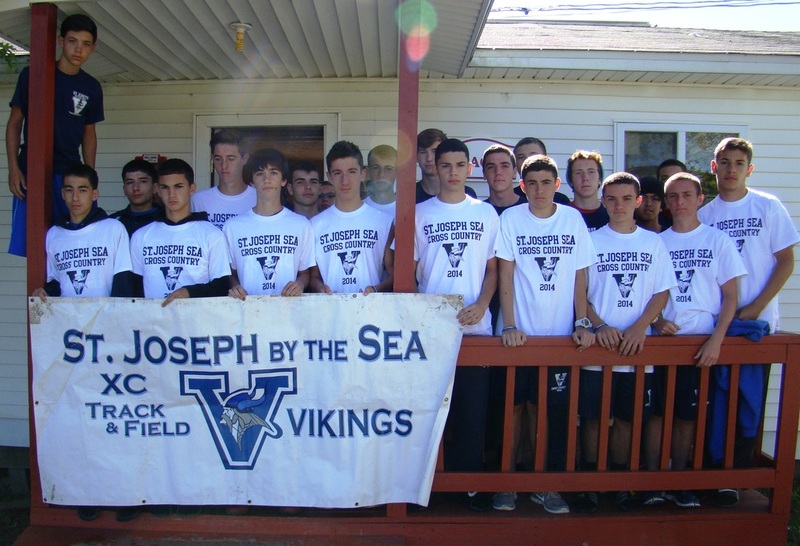 4/1 - 8th Annual Blue & Gray Invitational - St. Joseph Sea H.S. In a dominating performance, the GRAY team ends a 4 year winning streak for the blue team. Coaches Daniel Rosenbauer '15 & Tom Geoghegan '15 had a solid game plan and the team executed it to perfection. Meet records were broken in the Triple Jump, Long Jump, High Jump and 200 meter dash. Joe Somma, for the 2nd year in a row, wins three events - 100, 200 & long jump. The Vikings battle chilly temperatures to kick off the 2015 outdoor season. The team wins the Varsity LJ relay, SMR & DMR's. The Vikings scored an impressive team victory for our first S.I. title since 2010 and our 4th overall. We scored in 15 out of 15 events. Junior Nick Velez earned the Track MVP award after a win in the 1000 and and a hard fought 2nd place and personal record in the 1600...after only 1 hour of rest. Joe Somma upsets the field in the 300 with 2 monster races. Garth Ikomi was crowned the Fastest Male in Staten Island off of his win in the 55 meter dash. Brandon Prato, the #4 seed going into the shot put, had a tremendous day with a 3 foot PR in the shot put en route to the win! The 4x800 ran competitive and on a big anchor leg by freshmen Michael Kieran, who raced like a veteran, nailed the victory. Click for an event-by-event summary & analysis. SHOCKER! After barely qualifying for the seeded section of the 4x800 trials; the Varsity 4x800 pulls off a shocker with a top 6 finish while punching their ticket to the 108th Millrose Games. Rob Ruspantini led off the relay in the thick of the race with a 2:03.6 carry. Nick Velez posted a PR of 1:57.3 while moving the team closer to the leaders but more importantly opening up a gap on the 7th & 8th teams. Robn Guidicipietro ran a PR of 2:04.9 to keep the team in the top 6 on the 3rd leg. Mateo Velez, who just over a year ago went for open heart surgery ran a PR of 2:07.8 to hold off a fast charging Molloy runner. The team's 8:13.83 FAT represents a seasonal best by over 8 seconds. The 4x200 relay raced well and smashed the school record by 1 full second. Unfortunately, the relay would just miss out on a Top 6 qualifying position. It took a blazing fast 1:32.84 FAT to qualify for the Millrose Games. It wasn't pretty but the Varsity 4x8 garners a spot in the "seeded section" at the Millrose 4x800 Trials by way of a seasonal best of 8:21.26 FAT. Junior Michael DiBiase jumps 12'-0" in the PV which earned him a 6th place medal. Brandon Prato sets a PR in the shot with a 44'-1.5" toss. Tom Geoghegan hops, skips & jumps his way to a 38'-9" PR in the TJ. Kyle Sinclair breaks his PR by 1 foot (38'-8.75") en route to a Soph Sectional & NYC Championship in the triple jump. He would later add a 3rd place in the Sectional 55 HH. Peter Trapanese threw 36'-6" which was good enough for 6th place. The Vikings ring in the new year with some solid performances & hard earned medals. Competing in Boston for the first time since 2009; the team has a really nice showing. Nick Velez took 3rd place in the 1000 with a personal best of 2:35.75 FAT. His time is currently in the Top 10 in NY State. Robbie Guidicipietro, recovering from the flu, runs a PR in the 2mile with a 6th place time of 10:08.21 FAT. Joe Somma earned a 5th place medal in the LJ with a jump of 19'-7.75" The team earns medals in all 3 relays: 4x200 (5th place), 4x400 (6th place) and 4x800 (4th place). Thanks to our great alumni for helping out at this meet: Frank DeLeo '13, Alex Gargiso '13, Alex Rosenbauer '13 & Sam Mondello '13. We'd also like to thank the Cardona, Mahoney, Velez & Guidicipietro families for traveling up to Boston & cheering on our team! After 16 years, the Varsity 4x200 record is broken by Joe Somma, Garth Ikomi, Jordan Daniels & James Mahoney. The impressive part is the guys weren't fresh as most guys were in their 2nd or 3rd event. Somma earler had jumped over 20 feet for the first time in the long jump. The 2014-2015 indoor season kicks off with some impressive performances across the board. Frosh Michael Kieran gets things kicked off with a 1st place medal in the Frosh 1600. The Soph 4x400 relay earn 3rd place medals. The Varsity SHR runs well as all 3 men set a PR en route to a 4th place finish. The Varsity 4x800 runs solid with PR's by Robert Guidicipietro, Rob Ruspantini & James Mahoney. They would earn 5th place medals. The Varsity LJ Relay squeaks out a 5th place medal as Joe Somma & Tom Geoghegan combine to jump 36'-9.25". The Varsity HJ Relay of Jordan Daniels earn silver medals. Brandon Prato sets a PR in the Varsity Shot and Pole Vaulter Michael DiBiase ties his best jump by clearing 12'-0". In the weight events, the team wins the Sub-Midget & Junior Weight 4x200 relays. Bronze medals were earned by the Midget 4x200 relay and Junior Weight 4x200 "B" teams. Mateo Velez breaks 2:10! Garth Ikomi runs 23.0! A total of 50 PR's were set and 25 medals earned on the day! In chilly temperatures, the Vikings close out their XC campaign with 4th place finishes in both the Varsity & JV races. Robbie Guidicipietro finishes in 2nd as Nick Velez upsets the field with a 5th place finish. Michael Kieran ran a #2 FR All-Time performance with an 18:52. The future bodes well for the Vikings as 6/7 return for XC 2015! Rob Guidicipietro & Nick Velez represent St. Joe's at the state championships. They finished as the 2nd & 4th best for S.I. finishers. The Varsity team ended their VCP season with 5 of 7 leaving with PR's. Robbie Guidicipietro punches his ticket to the NY State Championships with a PR of 13:24. Fellow junior Nick Velez earns the trip upstate as well with a 13:43. The biggest PR on the day was set by junior Rob Ruspantini who ran a personal best of 14:16. Frosh Michael Kieran lowers his frosh school record to 14:50. Senior Captain Daniel Rosenbauer breaks 15 minutes for the first time! Rob Ruszkowski sets the biggest PR on the day with a 16:40 in the JV race. The team battles cold & rainy conditions throughout much of the day. Lucas Lafferty sets a 13 second PR to drop under 9:40. Garret Hughes (36 secs) and Mike DiSanto (19 secs) set big PR's. Rob Ruspantini, Mike Cardona & Mateo Velez set PR's. Mike Cardona breaks 15 minutes! For the first time ever both the NYCHSAA & BQCHSAA sections ran a combined race to name a "NYC CHSAA Champion." Rob Guidicipietro finished as the 12th best runner in NYC City. Rob Ruspantini recorded a big 15 second PR. Ryan McNamara smashes 17 minutes in the JV race! 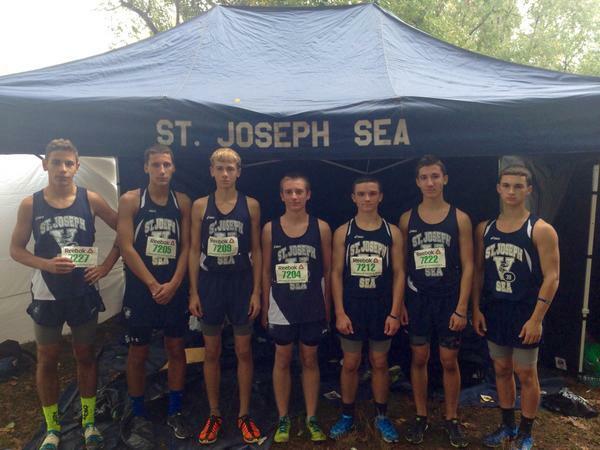 The varsity team would finish in 5th in the NY section & 6th overall in NYC out of 19 teams. The Goodard Park all-time lists were re-written with some nice races throughout the day. Lucas Lafferty got things started off with his 2nd school record in as many races. This time he runs 15:25 for the Frosh 2.5 course to knock down the great Frank Recce '06 who ran 15:25 in 2002. Robert Guidicipietro places 4th in the Varsity II race with a 16:13. His time breaks the school record that was held by Alex Civitano '11 by 10 seconds. Fellow junior Nick Velez runs 16:47 which is good enough for #3 ALL-TIME. Rob Ruspantini breaks out as well in the varsity race. The Varsity 5 man average record falls as well as this year's squad narrowly topped the 2003 team 17:14 to 17:18. Big year to year improvements for the team; most notably Ryan McNamara who dropped 2:50 secs. The Vikings leave VCP by going 16/16 PR's at the "Biggest & Best" cross country meet in the country. Lucas Lafferty got things started with a 6:52 in the Frosh 1.2 mile race which made a 3way tie for the top time on the frosh all-time list. Robbie Guidicipietro ran 13:30 to lead all Staten Island athletes on the day. His time is currently #3 ALL-TIME and the #1 JR All-Time. Junior Nick Velez raced with confidence by smashing 14 minutes en route to a 13:44. His time is #12 ALL-TIME and #5 JR All-Time. Rob Ruspantini, James Mahoney & Michael Kieran all break 15 minutes. Kieran's 14:47 smashed the 2.5 school record by 12 seconds! Mateo Velez breaks 16 minutes! A very productive day in the Bronx! Junior Robbie Guidicipietro wins for the 2nd time in 3 meets so far this season. The Vikings make their VCP debuts at Van Cortlandt Park in the Bronx. Frosh Michael Kieran got things started off first with a 7th place, 9:05 time in the 1.5 mile race. His time is the #5 Frosh All-Time (#5 FR AT). Lucas Lafferty also records a fine opening time of 9:49 which was good enough for 17th place. Robert Guidicipietro places 4th in the Varsity "A" race with a 13:51 - #17 ALL-TIME & the 5th fastest on the Junior All-Time List. Fellow junior Nick Velez also runs well with a 14:09 while cracking the top 10. A big day for the Vikings across the board as the Varsity, JV & Frosh teams all leave Clove Lakes Park with first place plaques. The race, taking over for the defunct Rob Breen Invitational (2006-2013) honors our fallen captain who passed away in 2002. Robert Guidicipietro paced the Varsity & won the individual title with a fast 17:!4, winning by over 40 seconds. His season debut is the #3 JR AT, #10 ALL-TIME. Frosh Michael Kieran ran a blazing 8:26 as we won the frosh race. His time is #2 FR AT & only 7 seconds off the fastest frosh time in our school history. Lucas Lafferty & John Perotta race well and crack the top 5. The freshmen edge out Tottenville for first place in the team standings. Jeremy Cassamassino paces the JV to the team title.